The Addams family's lives begin to unravel when they face-off against a treacherous, greedy, arrogant and sly reality TV host while also preparing for their extended family to arrive for a major celebration. Nick Kroll as Uncle Fester, Gomez's brother. Elsie Fisher as Parker Needler, Margaux's daughter. The official character designs for the computer-animated Addams Family, based heavily on the original comics. 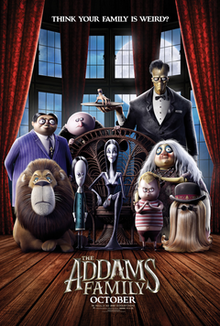 In 2010, after acquiring the rights to the Addams Family comics, the film originally began production at Universal Pictures and Illumination Entertainment as a stop-motion animated film directed by Tim Burton and produced by Chris Meledandri. However, in 2013, it was announced that Metro-Goldwyn-Mayer would produce an animated film based on the Addams Family comics, with Pamela Pettler writing the screenplay. In October 2017, it was announced that the film would be directed and produced by Conrad Vernon. Gail Berman and Alex Schwartz will produce the film, and Matt Lieberman will make revisions to the screenplay, and the film would be animated by Cinesite Studios, with Tabitha Shick overseeing the film for MGM. In December 2017, it was reported that Oscar Isaac was in talks to voice the role of Gomez Addams in the film. In June 2018, Isaac was confirmed for the voice cast, alongside the additions of Charlize Theron, Allison Janney, Bette Midler, Chloë Grace Moretz, Finn Wolfhard and Nick Kroll. In July 2018, Aimee Garcia joined the voice cast. In August 2018, Elsie Fisher joined the voice cast. The film is scheduled to be released by Metro-Goldwyn-Mayer on October 11, 2019. It was previously set for October 18, 2019 before moving back to October 11, to avoid competition with Disney’s Maleficent: Mistress of Evil. ^ a b "Mychael & Jeff Danna to Score Animated 'The Addams Family' Movie - Film Music Reporter". ^ "Addams Family Animated Film Gets Sausage Party Director". ComingSoon.net. October 12, 2017. Retrieved November 9, 2017. ^ a b c d McNary, Dave (December 15, 2017). "Oscar Isaac in Talks to Voice Gomez Addams in Animated 'Addams Family'". Variety. Retrieved December 16, 2017. ^ a b Kroll, Justin (October 12, 2017). "'Sausage Party's' Conrad Vernon to Direct Animated 'Addams Family' Movie". Variety. Retrieved November 9, 2017. ^ Fleming Jr., Mike (March 18, 2010). "Tim Burton's Next 3D Animated Film? Da Da Da Da, Snap Snap: 'The Addams Family'". Deadline Hollywood. Retrieved November 9, 2017. ^ Eisenberg, Eric. "New Animated Addams Family Movie Is In The Works". CinemaBlend. Retrieved November 9, 2017. ^ McNary, Dave (October 31, 2013). "'Addams Family' Reborn As Animated Movie At MGM". Variety. Retrieved November 9, 2017. ^ Hipes, Patrick (October 12, 2017). "MGM's CG 'The Addams Family' Movie Gets Animated". Deadline Hollywood. Retrieved November 10, 2017. ^ Trumbore, Dave (October 13, 2017). "Addams Family Animated Movie Hires Director Conrad Vernon". Collider. Retrieved November 10, 2017. ^ D'Alessandro, Anthony; D'Alessandro, Anthony (5 June 2018). "'Addams Family' Movie Scares Up Charlize Theron, Bette Midler, Allison Janney & More For Voice Cast". Deadline Hollywood. ^ ""Lucifer" Star Aimee Garcia Joins 'The Addams Family'". IMDb. ^ a b "'Eighth Grade' Star Elsie Fisher Joins Animated 'Addams Family' Movie (Exclusive)". The Hollywood Reporter. ^ Pederson, Erik (March 6, 2019). "Universal Shifts Damon Lindelof's 'The Hunt' To October; 'Addams Family' Moves Up A Week – Update". Deadline Hollywood. Retrieved March 6, 2019.